A passion about the science of sound drives every inch of our product design, from edge to edge and front to back. Take, for example, our SiM-Panels™ acoustic panels. 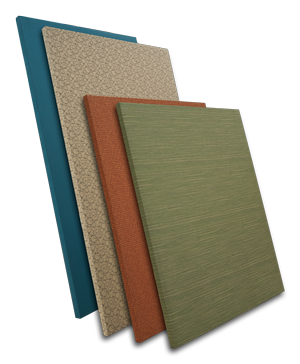 These sound-absorbing fiberglass panels use resin hardened edges or a rigid frame for stretch support. Impaling clips, Z-Clips, bullet catches or Velcro are provided for installation. Simplified Acoustics offers unbeatable choice of fabrics from the top brands – including 300+ standard options available immediately. Our exclusive sampling process allows you to see and feel your fabric selections before you order, so you can make the right choice for your room. Thickness of 1/2" to 4"
CALL 317-520-2590 FOR MORE INFORMATION. Why use SIM-Panels acoustic panels? A common problem with home theaters and media rooms isn’t the space inside. It’s the room’s boundaries. Some of these boundaries reflect sound more quickly than others. This difference in lag time creates “smearing” of the sound being produced. This diagram shows the Center Channel producing sound that goes directly to the listener and spreads out to the walls. The left wall is shown with SIM-Panels absorbs that absorb the sound so it does not bounce and smear. The right wall is shown with no acoustic panels. Sound is bouncing off the wall and arriving at the listener later, smearing the sound.